Allison McCulloch is Associate Professor of Political Science at Brandon University, Canada. Her research considers the design of power-sharing institutions in deeply divided societies. She is the author of Power-Sharing and Political Stability in Deeply Divided Societies (Routledge, 2014) and the co-editor of Power-Sharing: Empirical and Normative Challenges (Routledge, 2017). 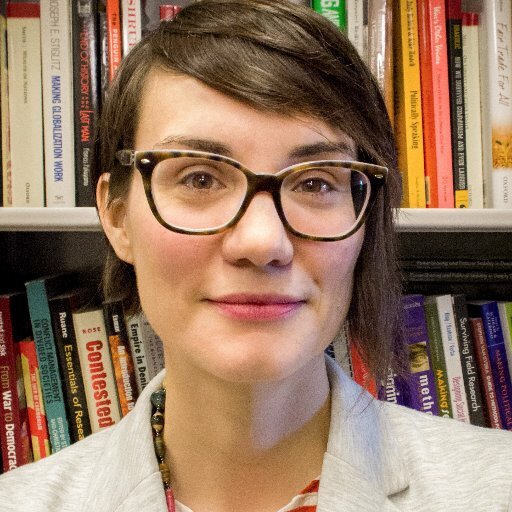 Her current research considers how power-sharing and constitutional design can be made more inclusive of identities beyond the ethnonational divide, with a particular focus on gender inclusion. Divided societies are marked by three characteristics that make designing democracy particularly challenging: they exhibit “a well-entrenched faultline” that has the potential for violence (often ethnicity, but sometimes also language, national identity and religion) (Guelke, 2012: 29); their politics is affected by “ethnic seepage” (Horowitz, 2001: 8), that is, political issues tend to cohere around the primary marker of division, and; they face “a lack of consensus on the framework for the making of decisions” (Guelke, 2012: 32). Two countervailing perspectives dominate the debate over constitutional design and conflict management in divided societies. Integration seeks “a single public identity coterminous with the state’s territory” whereas accommodation encourages “dual or multiple public identities” as well as “equality with institutional respect for differences” (McGarry, O’Leary and Simeon, 2008: 41). Both accommodation and integration see merit in federalism as a democratic mechanism for managing diversity but recommend different institutional configurations. A federation inspired by accommodation designs subunits in such a way as to secure self-rule for minority groups in their own units while maintaining shared rule between groups at the centre, as in Bosnia and Herzegovina, Belgium, and Canada. By contrast, the subunits of integrationist federations consist of heterogeneous units that cut across group lines where possible. This form of federalism is advocated for its dispersal of power, and thus conflict, away from the ethnic divide and is inspired by federal practice in such diverse places as the United States and Nigeria (Horowitz 2001). Scholars continue to actively debate the ability of either form of federalism to manage diversity, to build trust among contending groups and to create the conditions for stability and democracy in divided societies (e.g., Hale 2004; Zahar 2013; McGarry and O’Leary 2009; Roeder 2009; Horowitz 2001). Nonetheless, while integration and accommodation offer different visions of federal design, they both begin with the same reference point: ethnic divisions. Consequently, both display an institutional bias in favour of what might be considered ‘politically relevant’ groups. Groups that do not meet the threshold for political relevance – either because they are too small, too territorially dispersed or because they do identify with the dominant ethno-divide – face exclusion during the constitutional design stage and, later, in the processes of governance. That is, the inclusion of some groups in the design of institutions entails the exclusion of others. While ethnicity may be the primary cleavage in a divided society, it is not the only way in which citizens organise their lives. What gets lost when we only focus on one kind of group in the design of institutions? Micro-minorities, i.e., groups which constitute a small proportion of the overall population (often in the range of 1-5%), either as a result of their relatively recent presence in the polity (such as, migrant communities), their systemic exclusion from political participation (such as, Roma communities in Eastern Europe), their limited engagement with the polity (such as, Mennonite and Hutterite communities in North America), or their territorial distribution across the state (e.g. indigenous communities in settler societies). Re-aligned minorities, i.e., groups that define gender, sexuality, and/or able-bodiedness as primary identities impacting on their opportunities for engagement in political process but which are neglected in the democratic institutions. Why Might Others Matter for Federalism? And How Might Federalism Affect Others? Does federalism constrain or enhance the mobilising potential of others? Some scholars point to a “federalism advantage.” The claim is that federalism enhances the mobilising potential for others through “venue shopping,” or the ability to lobby more than one level of government. That is, “if one door is locked, a number of other doors may be unlocked” (Stockemer and Tremblay, 2015: 607). Yet, the availability of multiple access points is contingent on federal design. In a study of women and LGBTQ mobilisation in Belgium, Karen Celis and Petra Meier (2016) found that such advocacy work was constrained by the fact that accommodationist designs, such as Belgium’s, provide for the exclusive division of competences between levels, thereby limiting the potential for venue shopping. Mobilisation was further limited by the replication of the ethno-linguistic divide in civil society. In Belgium, women’s and LGBTQ groups exist primarily within each linguistic community (Celis and Meier, 2016: 7), and there are few opportunities for them to work collectively. The federalism advantage is thus not always so straightforward. Does federalism produce differential policy impacts for others based on their geographical position? The concern here is that as powers are divided and allocated, federations might assign “issues that are significant to women (such as welfare programs and social policies) to the less powerful and less well-resourced sub-national governments” (Stockemer and Tremblay 2015). While some federations have equalisation strategies to minimise differences in outcomes, others do not. Women in Bosnia and Herzegovina, for example, have very different levels of access to maternal health benefits depending upon which Entity and which canton they reside in (Women’s Network BiH 2015). The resolution of family law matters, including custody, child support and protection order enforcement, can also be quite variable depending on the nature of the federal design (Vickers, 2013b: 58). Does federalism promote or limit the legislative representation of others? Another important line of inquiry investigates whether federations have greater levels of representation of others than do unitary states. Either federalism’s multiple access points serve women well by creating a greater number of elected positions to fill and more opportunities to lobby for gender equality or federalism hinders their access, relegating women and others to “less important levels of the decision-making process” (Stockemer and Tremblay, 2015: 609). Stockemer and Tremblay (2015) find that federalism has a moderate effect on representation, returning 3-4% more female representatives than unitary states. Here too, results may be contingent on the form federalism takes, with the relationship between federalism and representation not always clear-cut. While further empirical inquiry is still needed, it is clear that institutional designs that only focus on ethnicity – whether to reinforce it or cut across it – tend to obscure the complex ways in which citizens organise their lives, thereby calling into question their long-term democratic legitimacy. The design of democratic institutions is often a contentious process and it remains an on-going challenge to cultivate institutional legitimacy. As Donald Horowitz (1993: 18) has remarked, divided societies exhibit a “tendency to conflate inclusion in the government with inclusion in the community and exclusion from government with exclusion from the community.” For this reason, it is important to design institutions that support democracy for dominant groups, including ethnic minorities. Yet, non-dominant groups – the others – also deserve recognition, representation and access to democratic decision-making channels. Even if a federation’s origins are ethnic-specific, this should not preclude bringing gender, sexuality, class and other non-ethnic identities into the design process. Doing so acknowledges that citizens’ identities are complex and multi-layered. Reflecting the varied ways in which citizens organise their lives in governing institutions is likely to enhance institutional legitimacy and stability, qualities that are often in short supply in divided societies. Agarin, Timofey and Allison McCulloch. 2017. Exclusion amid Inclusion: Power-Sharing and Non-Dominant Minorities. Paper presented at the Joint IPSA Colloquium on Democratization and Constitutional Design in Divided Societies, Nicosia, Cyprus. Guelke, Adrian. 2012. Politics in Divided Societies. Cambridge: Polity Press. Hale, Henry. 2004. Divided We Stand: Institutional Sources of Ethnofederal State Survival and Collapse. World Politics 56, 2: 165-193. Horowitz, Donald. L. 1993. Democracy in Divided Societies. Journal of Democracy 4, 4: 18-38. Horowitz, Donald. L. 2001. Ethnic Groups in Conflict 2nd edition. Berkeley: University of California Press. McGarry, John and Brendan O’Leary. 2009. Must Pluri-National Federations Fail? Ethnopolitics 8, 1: 5-25. McGarry, John, Brendan O’Leary, and Richard Simeon. 2008. Integration or Accommodation? The Enduring Debate in Conflict Regulation. In Constitutional Design in Divided Societies, ed. Sujit Choudhry. Oxford: Oxford University Press. Phillips, Anne. 1995. The Politics of Presence: Political Representation of Gender, Race and Ethnicity. Oxford: Oxford University Press. Roeder, Philip. 2009. Ethnofederalism and the Mismanagement of Conflicting Nationalisms. Regional and Federal Studies 19, 2: 203-219. Stockemer, Daniel and Manon Tremblay. 2015. Federalism and Women’s Representation: Do Federations have more Women Legislators than Centralized States? Publius: The Journal of Federalism 45, 4: 605-625. Women’s Network BiH, Annual Report on the State of Women’s Rights in Bosnia and Herzegovina in 2014, Human Rights Paper 7. Vickers, Jill. 2013a. Is Federalism Gendered? Incorporating Gender into Studies of Federalism. Publius: The Journal of Federalism 43, 1: 1-23. Vickers, Jill. 2013b. Territorial Pluralism and Family-Law Reform: Conflicts between Gender and Culture Rights in Federations, North and South. Politikon: South African Journal of Political Studies 40, 1: 57-82. Zahar, Marie-Joelle. 2013. A Problem of Trust: Can Federalism Silence the Guns? In The Global Promise of Federalism, eds. Grace Skogstad, Martin Pappillon, Keith Banting, and David Cameron. Toronto: University of Toronto Press. Choudhry, Sujit. ed. 2008. Constitutional Design in Divided Societies: Integration or Accommodation? Oxford: Oxford University Press. Haussmann Melissa, Marian Sawer and Jill Vickers, eds. 2010. Federalism, Feminism and Multilevel Governance. Surrey: Ashgate. Skogstad, Grace, Martin Pappillon, Keith Banting, and David Cameron, eds. 2013. The Global Promise of Federalism, Toronto: University of Toronto Press.